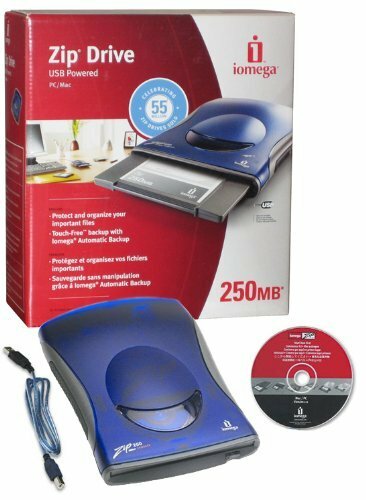 Iomega 250MB USB powered Zip Drive for use with PC or Mac. Protect and organize your important files. Touch free backup with Iomega Automatic Backup software (may not work with newer operating systems). Includes Zip Drive, USB cable, Solutions CD with software and Quick Start Guide. Compatible with 100MB and 250MB Iomega Zip Disks. Not compatible with 750MB Zip Disks. Records on 250MB and 100MB disks. Not compatible with 750MB disks. PC and Mac compatible. Microsoft Windows 98, 2000, Me, XP and Vista. Included Iomega software will not work with Vista.